It is a recurring controversy and, with the arrival of summer and a greater influx of pilgrims, the problems are increased. 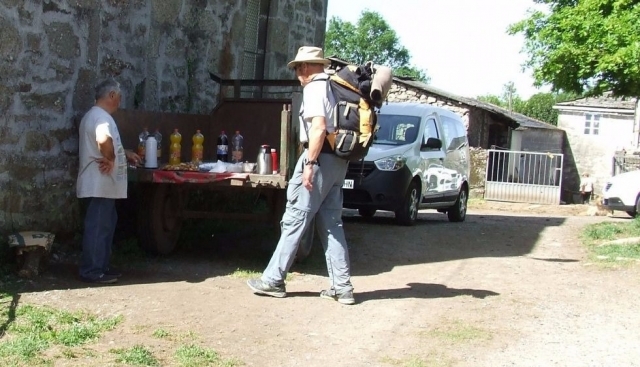 Asociación Gallega de Albergues Privados (AGALBER) has denounced that it is increasingly common to see people making illegal sales - without authorization - to the pilgrims who make the Camino de Santiago, especially on the most frequented routes. In most cases these products are drinks and certain foods. They are placed in the edges of the official route and in certain zones of maximum affluence. They place their makeshift stalls of sale to supply the pilgrims, who mostly buy in these outposts for convenience. It is very common to see these illegal sellers on the French Way. AGALBER has presented graphical documents of these infractions. In one of them a man can be seen selling sodas and food in the trailer of a tractor. Asociación Gallega de Albergues Privados assures that this seller, as well as others that are located along the Way, lack any type of permit. These sellers will be more numerous during the months of good weather, reason why AGALBER warns to the pilgrims and they demand surveillance by the authorities. Recently the agency communicated its complaints to leaders of Turismo de la Xunta, who already are acting in consequence.